(2017/11/25) After Peter Heppner appeared as guest during Camouflage’s 30th Anniversary Concert in Dresden, Marcus has now appeared as guest vocalist supporting Peter Heppner’s 30th Anniversary Tour. 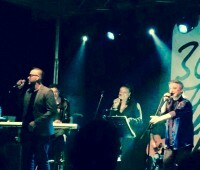 In already 5 cities Marcus joined Peter on vocals and they performed together the two Camouflage songs “That Smiling Face” and “Count on Me” as well as the Wolfsheim song “Kein Zurück”. An additional guest, Kim Sanders, joined the concerts in Dresden and Erfurt as well as the final concert today in Potsdam. The American singer Kim Sanders should also not be unfamiliar to Camouflage fans since she wrote Camouflage’s hit “I Can’t Feel You”.